Rihanna covers the June 2018 edition of US Vogue. The Barbadian superstar stuns in photos shot by Mert Alas and Marcus Piggott at Casa Salomon in Ibiza. Tonne Goodman was responsible for styling and she selected a mix of the most perfect summer and fall pieces. The issue is on newsstands now. On the cover Rihanna wears a black Dolce & Gabbana dress with silver jewelry. Next is a beautiful shot of Rihanna in profile. The singer wears a pair of Jennifer Fisher‘s 3″ Samira hoop earrings ($650) and a neoprene and mesh swimsuit ($255) by Stella McCartney. Here we have Rihanna in a Chanel one-piece swimsuit and Christian Louboutin‘s Jonatina embossed silver sandals ($795), which have a mix of leather and PVC straps as well as a 4″ stiletto heel. She also wears a pair of Tiffany & Co Elsa Peretti wave hoop earrings that cost $525 but are currently unavailable online. Her bracelet is Yeprem‘s gorgeous $29,500 pearlescent hand bracelet. The 18k white gold bracelet features pearls, 3.23ct round diamonds and 1.81ct marquise diamonds. Contact the brand about availability. Her ring is by Lynn Ban. 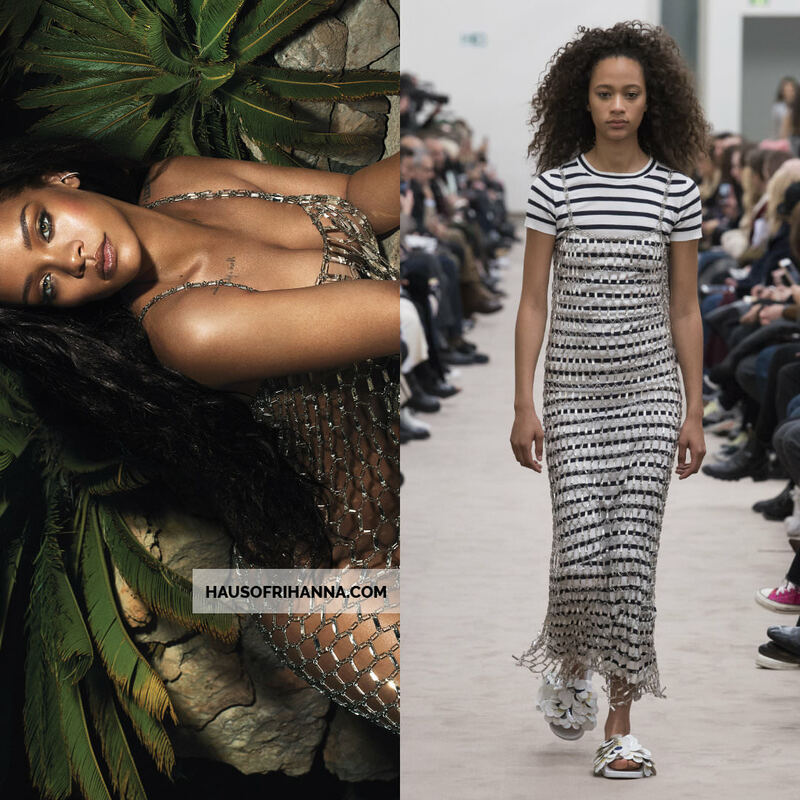 Rihanna reclines in a silver gown from Alberta Ferretti‘s Fall/Winter 2018 collection [Look 37] and a pair of Christian Louboutin‘s Benedetta sandals from the Fall 2015 collection. Her earrings are the same Jennifer Fisher hoops mentioned earlier. The songstress and business mogul looks strong in a black one shoulder swimsuit ($182) by Michael Kors. The one-piece swimsuit features shirring, pleats and padded cups. Her lucite hoop earring and a few of her bangles are by Alexis Bittar. The rest of the lucite bangles are a mix of RJ Graziano and PONO by Joan Goodman. Pictured above are a lucite bangle set ($115) from PONO and Bittar’s tapered bangle ($59.50). Lastly, we have Rihanna in a Fall/Winter 2018 dress by Paco Rabanne. Her diamond Lynn Ban jewelry includes the designer’s new Halo ear cuff.